We received 294 amazing applications from over 43 countries (men: 45% women: 55%). Thank you to everyone who applied. Like OXLAEY on Facebook or sign up to our email newsletter so you won’t miss any new residencies and cultural heritage news. 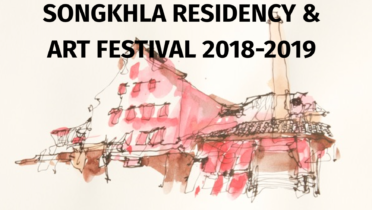 SONGKHLA ARTIST RESIDENCY in THAILAND! We are offering four positions as artist-in-residence between November 2018 and January 2019. The residencies are from 4 weeks to 8 weeks in length. We provide each artist a free, private room with air-conditioning, a free studio / working space, a free exhibition space, a food stipend of 360 Baht per day, and a one-time stipend of 5000 Baht, which can be used towards travel, incidentals or art materials. We also provide each artist an English-speaking support team, to help those who want Thai language support. Access to the following can be made available on an “as needed” basis: basic office materials, office printer, scanner, a bicycle, etc.. The residency does not cover medical insurance. We cannot sponsor a visa, and all artists are volunteers (thus tourism visa). The artist is responsible themselves for any other costs or expenses that may be incurred during the duration of the residency including art supplies, health insurance, etc. You must also share this link on social media: www.oxlaey.com/2018/03/songkhla-art-residency. We’ll confirm via email after receiving your application. Applications are accepted from 1 April 2018 until 1 August 2018. • Citizens of all countries, artists of all ages, and all genres of art. We favor artists who want to engage with our local community, want to learn about Songkhla’s local culture and reflect this back in their art, and can create art which captures the imagination of the local community. • Allow locals to visit your studio. We accept first-stage applications from 1 April to 15 August 2018. The application form is here. After filling out the form, artists should take a picture of the completed form OR save it as a PDF and send it to Ryan Anderson at oxlaey@oxlaey.com. Alternatively, you can also send your completed form via Facebook via messenger (send to www.facebook.com/oxlaey). Ryan Anderson will send back an email or Facebook message, confirming that we have received your application. There are no other ways to apply (no calls, etc.). You must also share this link on social media: www.oxlaey.com/2018/03/songkhla-art-residency. If you are shortlisted as a finalist, you will be contacted again by Ryan Anderson for a video interview. After the video interview, finalists will be asked to submit a full proposal. We will choose 4 winners and 2 runners up. Ideas of how to engage and impact Songkhla’s local community through art. The Songhkla Heritage Trust is a registered Non-Governmental-Organization in Thailand. Our mission is to promote the regional culture and encourage the revitalization of Songhkla’s old town. We are headquartered in the historic Red Rice Mill in Songkhla. Our team regularly teaches students and visitors about the history of Songkhla, organizes the “2nd Sunday Market” in the old town, and holds conferences on culture, heritage, and conservation. Our team also works with the Thai government to support Songkhla’s old town infrastructure, conservation guidelines, and tourism activities. You can find out more about the Songkhla Heritage Trust’s activities here: https://www.facebook.com/songkhla.asia/. Songkhla is one of the oldest towns in Thailand. It’s located on the eastern coast in southern Thailand. The nearest airport is in Hat Yai. With Chinese temples, Buddhist wats and Muslim mosques, Songkhla is one of the most culturally and ethnically diverse parts of Thailand. Songkhla also has three universities with approximately 30,000 students, a handful of new cafes, a budding art scene, and a beach! Songkhla has only a few foreign tourists but is full of small town charm. OXLAEY is a cultural heritage travel magazine. Ryan Anderson leads the project which is made possible through a network of volunteers. We all work together for free to document and promote our world’s cultural heritage through videos, photos, recordings, and articles. We create stories about singers, painters, poets, craftsmen and craftswomen, as well as traditions and religious rituals. You can find out more about OXLAEY at www.oxlaey.com and you can watch some of OXLAEY’s documentary shorts from Songkhla here: http://www.oxlaey.com/category/thailand.